At first glance, they appear to be opposites, but if you look closely, you will understand: these two are halves of a single whole and at times behave this way, although they do not admit it. Sometimes Taurus shows self-will, and Scorpio - such a passionate determination to achieve their goals, that they are able to blame each other for being stubborn. And they are really stubborn. Parents-Scorpios will induce Taurus to achieve the highest manifestations of his "I" in all that he does. Scorpio is sure that life is a continuous series of problems, but even failures can be seen as an opportunity to learn something and clarify their ideas. Taurus is a more mundane creature that perceives life as it sees it. He does not want to sail on unexplored seas, which poses a threat to his confidence. 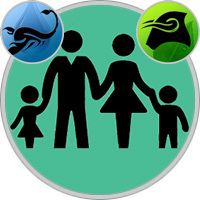 Scorpio parents need to respect Taurus’s need for inner comfort and his desire to remain safe. This is a powerful couple, and their union can really be constructive - you just need to want it. Both belong to those resolute but stubborn personalities, which are difficult to move, so that small, but persistent disputes will not, perhaps, end and end. But Scorpio Mom should still see to it that the storm subsides in time, because the child is just a child. She will not benefit from her perseverance, so she’d better try to apply a weasel, and Taurus’s disobedience will be lifted by hand. In addition, Taurus does not possess Scorpio’s super-energy. He prefers to move forward at his own pace, making respites on his own. But in the end he will come to the goal! And even make it better if he is not rushed. Yes, he wants to succeed - especially if it brings him material prosperity. Therefore, when it comes to exams, he will work with enviable persistence, especially if in time to remind him that with good results he can get a better job. Mom-Scorpio will always stand behind his child, pushing him all the time, because he wants him to be the best in the group. In fact, she dreams of her child reaching all that she failed. This is a heavy burden for Taurus, who terribly does not like to be breathed in the back of the head. He enjoys home comfort and does not want to go where he is being driven, even if this is the path to success. Nevertheless, if Taurus is serious about any business, one can only marvel at his determination. He will go ahead, crushing all the obstacles on the way. And the mother’s help in the form of support and approval will give him a significant acceleration! Only Taurus needs to know that this is his own choice, and not a concession to his mother... Taurus loves stability, and this is provided to him by the Scorpio mom, creating a house where well-being, order and reasonable behavior are of great value. And Taurus feels here on the spot. True, sometimes the Scorpio mom "muddy the water," something non-telling. This embarrasses and upsets Taurus, who can take something and at his own expense. Taurus prefers that everything be done in the open and easy to understand. And everything that happens secretly, forcing him to obey someone else’s will, instills in him insecurity and fear for his so valuable well-being. Scorpio likes the amazing calmness of her child - she herself would also like to cope with her turbulent emotions in crisis situations, as Taurus can do. But she is so annoyed by Taurus’s stubbornness and his complete reluctance to move from the usual point of view! It’s just that Mom-Scorpio needs to remember that you do not need to put pressure on Taurus. And the reward for this will be the warmest love and appreciation of her child, even when he becomes an adult. Strong Scorpio believes that his word in the house is the law. Little Taurus appreciates the well-being and stability that his father gives him, and yet collisions are inevitable, especially if the child wants to go his own way, refusing to give in to his father. Scorpio dad even doubts that he can insist on his own, because Taurus is so stubborn! Fortunately, usually Taurus is even happy when the father gives him advice. It is so practical to know what awaits you, the main thing is that all this should be reasonable and understandable. Taurus admires in the father that he is a man of action, that he has a living mind and that he is able to protect his family and value his property. In addition, according to Taurus, the father is right about money, because for both of them it is important to be able to earn them. Scorpio believes that money is independence and the ability to control life, and Taurus understands that money is security and well-being, comfort and pleasure from owning what you like. And Taurus will patiently save up the right amount to buy the item he likes. Probably, piggy banks were invented specially for him! This two people do not like special changes, so there will not be frequent moves in the family. Scorpio is concerned that this will put him in dependence on an unfamiliar situation. Well, Taurus just loves the comfort of a family hearth, a small group of trusted friends, a favorite sweater and an old dog. Why wish for something new? However, if this "something" will be better than it has been so far, and help his father feel even more confident, and Taurus will give an even greater sense of well-being - then both will not object. Sometimes a calm Taurus get angry, showing a pent-up irritation. Perhaps he is angry that his father gives orders, not listening to his opinion, or it seems to him that his father is becoming too strict. But the secret is that Scorpio feels stronger when people begin to get angry, because they lose control over themselves, and Scorpio is only on hand. So Taurus is difficult to prevail in this situation. And then the father should just caress his child, giving him the opportunity to cool down, otherwise his Taurus will become even more stubborn and sour. After all, he’s just a child, and the father is already firmly holding the reins in his hands, so there is no need to prove anything else. Both the father and the child are united by the love of tradition, and over the years it will manifest even more. And Taurus will know what he can expect from his father-Scorpio of the devotion and understanding that he needs so much.